Ok, I wasn't going to do a giveaway, but I just couldn't help myself. So here is the week's book. 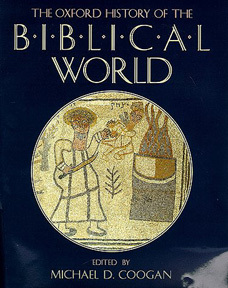 Michael Coogan The Oxford History of the Biblical World (2001). Here is the blurb. In this impressive volume, leading scholars offer compelling glimpses into the biblical world, the world in which prophets, poets, sages, and historians created one of our most important texts--the Bible. For more than a century, archaeologists have been unearthing the tombs, temples, texts, and artifacts of the ancient Near East and the Mediterranean world. Using new approaches, contemporary scholars have begun to synthesize this material with the biblical traditions. The Oxford History of the Biblical World incorporates the best of this scholarship, and in chronologically ordered chapters presents the reader with a readable and integrated study of the history, art, architecture, languages, literatures, and religion of biblical Israel and early Judaism and Christianity in their larger cultural contexts. The authors also examine such issues as the roles of women, the tensions between urban and rural settings, royal and kinship social structures, and official and popular religions of the region. Understanding the biblical world is a vital part of understanding the Bible. Broad, authoritative, and engaging, The Oxford History of the Biblical World will illuminate for any reader the ancient world from which the Bible emerged. So put your name below and I will choose a winner on Sunday. Mike Gastin, if you please. Adam Parker, looks great, thanks!